Life-of-Ryan: We're going to Florida to see Daddy and Alligators! Are we Reeaallly going to Florida, Mommy? I've been waiting Soooo Long! Hurry, Mommy! Daddy said he will take us to See Alligators! There's still Snow and it is Cold here, Mommy. Florida is Warm, right? Yes, Ryan. Daddy said it will be Nice and Warm for our Vacation. It's getting Dark, Mommy. When will we be in Florida? We'll be in Florida Late Tonight, Ryan. Why don't you Rest? It is a Long Trip and you're Sleepy. Good morning, Ryan. We're with Daddy in Florida! Good Morning, Ryan! I'm Soooo Happy to See You and Mommy! Look outside, Ryan. The Sun is coming up. It looks like a Bear-ry nice Day!!! Before we go to the Park to see Alligators we have to eat a Good Breakfast. Let's go see Alligators, Now, Daddy. Wanna' see some Alligators, Mommy? First, Mommy and Daddy have to pack a Lunch for the Park, Ryan. Then we will go. We are at Myakka River State Park, in Sarasota, Florida. It is a Big Park. Daddy. The Trees here are Very Pretty. Yes, Ryan. These are Pretty Trees. Look, Mommy. There is a Big White Bird. Here is the Myakka River, Ryan. I can't see the Alligators, Daddy. Where are the Alligators? We will have to go Look for them, Ryan. Let's eat Lunch First. I see that Mommy got you New Shorts and New Sandals. Try to keep them Dry. Let's look in here for Alligators. The Water is Shallow and we may find some Baby Alligators. That is a Young Alligator, Ryan. He is about three foot long. He is Warming Himself in the Sun. Over here, Ryan! Here is Another One! And it is Larger! He is Running Away from us because I am Larger than him and he is little bit Afraid. Let's try to get Closer, Ryan. This is your First Time Seeing an Alligator! Daddy– he has a Really Big Mouth– and TEETH! I just want to Look at Pictures of Alligators from now on. Let's do Something Else, now. Mommy. Look at All the Butterflies. What are they Doing, Daddy? They are Drinking Nectar from those Flowers. Nectar is a Sweet Flower Juice. Look, Mommy! I am Drinking Sweet Nectar too– just like the Butterflies. Will this make me a Sweet Bear? Look, Ryan. There is a Hawk! Look, Daddy. There is a Sign! What does the Sign Say, Mommy? Ohhhhh… Daddy! Those Alligators could have EATTEN me! Mommy. Daddy. I have Seen enough Alligators for Today. Can we go Home, Please? I like Florida, Daddy. And I Love you and Mommy! Today, I had a Scary-Fun Day! This is really evolving beautifully. Could make so many positive comments - wow, that cloud picture! What creative thinking. Really clever photography and excellent 'staging.' I recognize that a great deal of work goes into these, and it shows. Looks like you are having a good time on your winter bear-cation. You be sure to keep an eye out for stray alligators. What an exciting trip! I'm so happy that the alligator didn't eat you! Looks like a very nice trip! And I like the bear shaped cloud a lot! That lunch looks yummy and healthy and wonderful! Looks like a fabulous trip! mmmmmmm, gotta get me some pita! Have a great day and nice to see you on my blog! Brilliant trip - but I hope you have a security blanket!! let me know if you need one....!! Security blankets are Very Important When You're Seeing Scarey Animals. Yummy food an luvly seenery, but yu do hav to be very careful rownd thoze reptillyen types- livin wiv Dilly, I kno how sneeky they can be! Yu hav to watch them! Nose hugs to you too, BT. 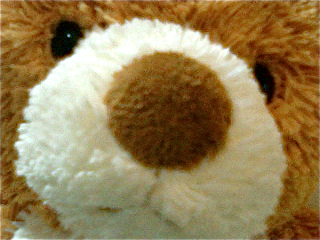 My Daddy was sick in the hospital (with Pleurisy-- he said it Hurt – Lots -- and that little Bears never get Pleurisy... so I shouldn't worry) and he said that it felt good to see that you had sent me a Nose Hug! The Snow is Going Away! Let's Play!